Texas Attorney General Greg Abbott’s office moved November 28 to seize the West Texas ranch that has been occupied by a breakaway Mormon sect and its polygamist leader, Warren Jeffs, who is imprisoned for the sexual assaults of two underage girls he considered his wives. With the filing of a warrant in Schleicher County, Abbott is seeking to confiscate the Yearning for Zion Ranch, the 1,600-acre property near Eldorado where state officials took – and later returned – 400 children of sect members out of fear for their safety. The filing marks the beginning of the attorney general’s final chapter in effort to pursue “widespread criminal misconduct” at a place where multiple children were sexually assaulted by members of the sect. 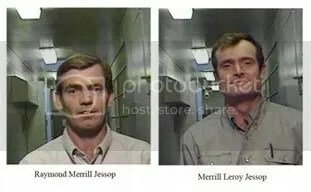 SAN ANGELO, Texas — In the harshest sentence yet for members of a Texas polygamist group, a Tom Green County jury has sentenced Merril Leroy Jessop, 35, to 75 years in prison and imposed a $10,000 fine on one count of sexual assault of a child.The jury deliberated on the sentence from 10:30 a.m. today until 2:35 p.m. Jessop was convicted Wednesday on allegations that he illegally married and fathered a child with a 15-year-old girl while living at the Yearning for Zion Ranch in Schleicher County in 2006. He is a member of the polygamous Fundamentalist Church of Jesus Christ of Latter Day Saints and was a resident of the sect’s YFZ Ranch outside of Eldorado. 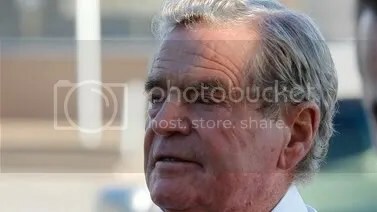 SAN ANGELO, Texas (Reuters) – A rural West Texas jury handed ex-bishop Fredrick Merril Jessop the maximum prison sentence of 10 years on Tuesday, a day after finding him guilty of marrying polygamist leader Warren Jeffs to a 12-year-old girl. On Monday, the jury found Jessop, 75, guilty of performing an illegal marriage ceremony, a third-degree felony punishable by two to 10 years in prison and a fine up to $10,000. After deliberating for an hour on Tuesday, the jury decided on the maximum prison time and the maximum fine.Fredrick Merril Jessop is guilty of performing a ceremony prohibited by law, marrying a 12-year-old girl to sect leader Warren Jeffs, a jury took one hour and 20 minutes today to find. Jessop, 75 and a former bishop of the , is charged with performing a ceremony prohibited by law, marrying a 12-year-old girl to sect leader Warren Jeffs. Jeffs is serving a life plus 20 year sentence for sexually assaulting that girl and a 15-year-old girl. In a new settlement, Christine Trampler, Martin’s mother, will receive $200,000, less attorney’s fees, which includes an appeal and a new filing. [October 16]Trampler’s ex-husband, Arthur Trampler, was found dead Monday night in an apparent carbon monoxide suicide at home in Springfield, Mo., officials there said. Busch had put him on the suit’s witness list but recently removed his name. In an out-of-court agreement, Martin’s father, Larry Eby, agreed to accept $200,000 from Busch and is no longer part of the lawsuit. 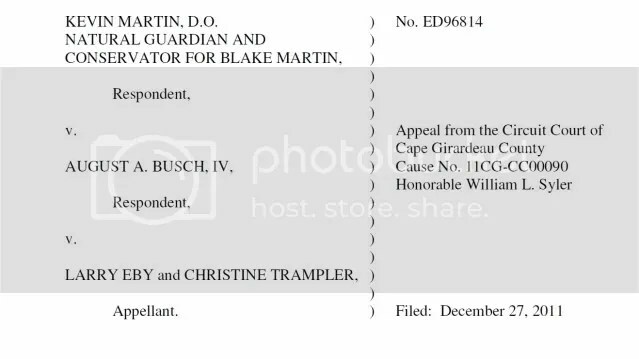 Kevin Martin, D.O., Natural Guardian and Conservator for Blake Martin, Respondent, vs. August A. Busch, IV, Respondent, vs. Larry Eby and Christine Trampler, Appellants. Respondent August A. Busch, IV’s application for transfer from the Missouri Court of Appeals, No. ED96814, denied. Draper, J., not participating. an appellate court found that Larry Eby and Christine Trampler had a right to join the case. The state supreme court on April 3 refused Busch’s request for reconsideration of the appellate court ruling. [February 15, 2912]The Missouri Court of Appeals in the Eastern District released an opinion today declaring that George “Larry” Eby and Christine Trampler — the parents of the late Adrienne Nicole Martin, former girlfriend of St. Louis beer scion August Busch IV — have the right to join in on the wrongful death lawsuit filed earlier this year on behalf of Martin’s young son, Blake. The three appellate judges, who ruled unanimously, cited Missouri’s Wrongful Death statute, which gives equal power to a decedent’s spouse, children and parents when it comes to recovering damages. The decision means that Martin’s mother and estranged father could possibly receive a piece of any settlement pie. It also means that Busch, who has kept a low profile since Martin’s death and originally sought to settle the matter quickly, won’t be shedding his legal baggage any time soon.